Today I bring you three disparate songs, related only by their connection to Andy Warhol. Actually, as far as I know, they have no easily discernible connection to the king of pop art. 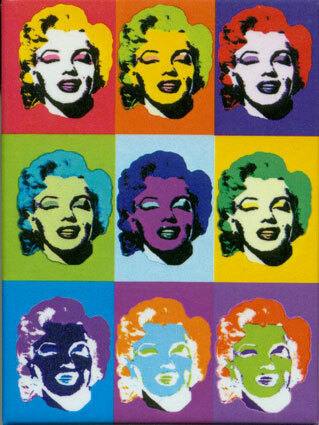 Warhol's prints of Marilyn Monroe were just the first visual representation of repetition that came to mind, and it is repetition that holds the following pieces of audio together. As Warhol used repeated images of faces and cans to transform otherwise unremarkable objects into more intricate pieces of art, fairly unsubstantial lyrics can create an unforgettable hook when sang over and over. The song that got the ball rolling for this entire post is "Done Done" by Frankmusik. What I've heard of Frankmusik's catalog reveals a standard electronic artist, and it shows in "Done Done." All the hallmarks are represented, including a pulsing bass, a loose, echoing snare drum and a warm synth pad. But when we reach the chorus at 0:45, Frankmusik's strict adherence to formula can be readily forgiven. There is something entrancing about the computer-aided repetition of consonants when it is combined with the the atmospheric quality of the synth pad. The chorus opens a the door to another dimension and it is unfortunate that the door must be closed. When "Done Done" came up on shuffle today, it brought "5 More Years" to mind, a gorgeous track that has been rattling in the back of my mind for a few months now. Unlike Frankmusik, Noah and the Whale manages to engage the listener beyond the chorus with their sunny pop, complete with breathy flute, gentle strings, ukulele and whistling. "5 More Years" is a testament to lyrical minimalism, exploring the beauty of each word through a simple melody. It doesn't hurt that the perfect male/female pairing would make anybody swoon. And just for fun, I would be remiss not to mention one of the more infectious uses of repetition of this new millennium: "Can I Get Get Get" by Junior Senior. I won't bother you with my words - just get to dancing.